Every year for Christmas my Mom gets me a subscription to a magazine. For the past few years it was Southern Living. This past year she asked if I wanted to continues SL and I decided that I would prefer Cooking Light. I love to browse new recipes and prefer healthy cooking because it really seems to fit best with the gluten-free lifestyle. I have saved every edition and have tried several recipes. This months issue, September 2008, rocks. I have earmarked at least 4 recipes to try. I decided to give the brownie recipe a try today. There were several reasons that this recipe jumped out at me. First, I love chocolate. I haven’t always liked chocolate, but ever since I was pregnant with Hannah, chocolate is #1 in my book. I thought it was just a pregnancy thing, but since she is now 6 years old, obviously that is not the case. Second, the recipe calls for cherry preserves. I love Polaner All Fruit Spreads, especially the black cherry. 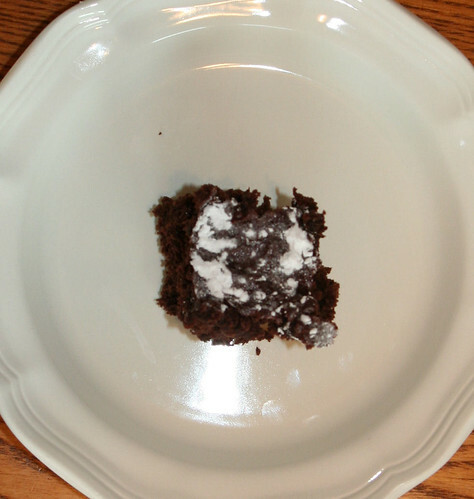 Third, there are only 155 calories and 5 grams of fat per brownie (ROCK ON). And finally, did I mention that I love chocolate? 😉 So, I set out to make these this afternoon. I had all the ingredients on hand, which is odd for me. These were super simple to make and adapt to gluten-free. I used an all-purpose flour mix of rice flour, potato starch (not flour) and tapioca starch. These were amazing. I really can’t put into words how good they are. They are moist and chocolatey. I am not sure why they are called dark chocolate, because there is no dark chocolate added to the recipe. 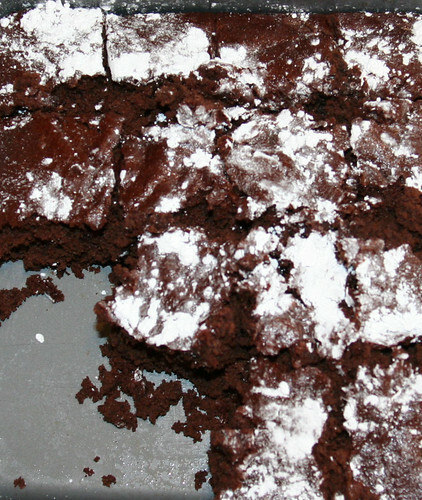 The black cherry preserves add a nice, subtle flavor and definitely help keep the brownies moist. I took a couple pictures. I really meant to take one before I cut the brownies, but was so excited to eat them, I forgot. So, please excuse the messy, cut up pan of brownies. I did manage to get a picture of Hannah’s before she dug into it. Both of the kids ooohed and aahhed over how good they were. Jon had 2 and begged for more, said they were the best brownies he ever had! 2. Line a 9-inch square pan with parchment paper and spray with PAM (I didn’t have parchment paper, so I just sprayed my pan with PAM; also, I only own an 8 x 8 pan, not a 9-inch square). 3. Lightly spoon flour into dry measuring cups; level with a knife. Combine flour, xanthan gum, sugar, cocoa, baking powder and salt in a large bowl; stir with a whisk. Combine cherry preserves, butter and water in a saucepan and bring to a boil. Add preserves mixture to flour mixture; stir well. Add egg & egg white; stir until smooth. Stire in chocolate chips. Scrape batter into prepared pan. Bake at 350 for 25 minutes or until a wooden pick inserted into center comes out with a few moist crumbs. Cool in pan on wire rack. Garnish with powdered sugar, if desired. Yield: 16 servings. Calories: 155; Fat grams: 5.4.